Figure 1. Sandhill cranes prefer unobstructed river channels as roosting sites. Develop a database on the geology, hydrology, ecology, geography, and socio-economic features of the Platte River Basin. Describe the geologic setting of the Platte River, define the importance of regional tectonics, local structure, and climate change on the evolution of the river, describe the fluvial architecture of sediments in the valley floor, and place modern depositional features in a temporal context. Describe interactions among streamflow, hydraulics, sediment transport, riparian vegetation, and channel geometry. Develop and apply flow and sediment-transport models to examine the interactions of water management with channel and bank geometry. Develop an understanding of the interactions between plant and animal communities of wet meadows and other riparian habitats and the hydrology and geomorphology of the river. Studies of the relations among soils, vegetation, soil organisms, and riparian hydrology are intended to provide important information on riparian grasslands and factors affecting the food base for cranes and other birds. 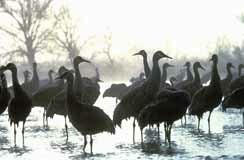 Other studies are concentrating on the role of the Platte River ecosystem as an important site for fat acquisition for migrant cranes and waterfowl. Scientists are studying how competition from growing numbers of geese, habitat loss, and increasing efficiency of corn harvesting techniques contribute to the declining rate of fat storage in cranes. Biologists are tracking cranes marked with satellite transmitters to determine how long individual cranes stop at the Platte, where they breed, and where they winter. This will provide a better understanding of their habitat needs and the role of the Platte Valley in supplying those needs. A companion study is addressing the diets, activities, and acquisition of fat and protein by lesser snow geese, greater white fronted geese, and northern pintails during spring migration in Nebraska. Biological information will be incorporated into ongoing geologic and hydrologic models of the Platte River to determine the extent of changes to riparian habitats and their significance to key habitats and wildlife species. The program is a cooperative effort between the USGS and many other Federal, State and local agencies and private entities. Coordination is being conducted, in part, through USGS participation in working groups related to the Platte River Endangered Species Partnership. Streamflows have declined in the last 50 years in the Republican River Basin in southwestern Nebraska, northwestern Kansas, and northeastern Colorado (fig. 2). The declines have led to conflicts over water in the basin, culminating with Kansas filing a lawsuit in 1998 against Nebraska, alleging violations of the 1942 Compact allocating water among basin states. At issue is the effect of irrigation development from the High Plains aquifer on streamflows in the basin. Figure 2. Republican River study area and locations of groundwater/surface-water interaction study sites. The USGS is conducting a study, in cooperation with the Nebraska Republican River Basin Management Districts and the Southwestern Nebraska Resource Conservation and Development Area, to evaluate groundwater flow and the interaction between ground water and surface water. The objectives are to quantify groundwater and surface-water interaction throughout the basin and to simulate the effects of future pumping on streamflow. Groundwater flow modeling is being used to predict flow conditions at specific locations in the aquifer. Data on aquifer physical characteristics, inflows, and outflows are being compiled for the 30,000-square-mile study area. Model results will be compared to measured values. The study is intended to provide a groundwater model that managers can use to estimate the effects of different groundwater pumping plans on streamflow in the basin. The results are intended to enable basin water managers to make decisions about groundwater and surface-water resources based on an improved understanding of the aquifers and their interaction with the Republican River. Field studies to investigate groundwater and surface-water interaction at three locations along selected principal tributaries of the Republican River also are being conducted in southwest Nebraska (fig. 2). These studies are intended to improve understanding of the dynamics of groundwater and surface-water interaction and will be compared to the modeling results. Water samples also are being collected from more than 300 irrigation wells in the Nebraska part of the basin to determine the water quality in the High Plains aquifer, which is the primary source of drinking water in the study area. Bird species native to the North American grasslands have shown steeper, more consistent, and more geographically widespread declines than any other group of birds during the last quarter of a century. To understand why bird species are declining, USGS scientists are comparing population data on native grassland bird species (fig. 3) with data on biological, physical, and human-use factors. The analysis includes such factors as habitats, management practices, and land use, and uses a geographic information system (GIS) to identify patterns of change in bird populations. Field efforts range from Montana to Mexico. Partners include State game and fish agencies, the Bureau of Land Management, U.S. Fish and Wildlife Service, National Park Service, nongovernmental organizations such as the Nature Conservancy, other private organizations, and individuals. The USGS is working with the U.S. Forest Service and other Federal, State, and private agencies to survey colonies of black-tailed prairie dogs in the northern Great Plains. The study uses sampling based on remote imagery obtained during aerial surveys. The last interglacial period (LIG) was the most recent time when global climates are thought to have been significantly warmer than now. The USGS is studying the LIG to understand the geographic scope and impact of future warm climates. LIG pollen and fossil records from Midcontinental North America are rare compared to those in Europe. Where pollen or fossil records are absent, the climate of the LIG in the North American Midcontinent may be inferred from properties of a buried loess (wind-blown silt), called the Sangamon loess, that formed during this period. The Sangamon loess formed in Nebraska between about 130,000 and 45,000 years ago. Modern loesses in a Midcontinent line from Ohio to Colorado show distinct changes in distribution particularly over the forest-prairie boundary, which, in presettlement time, was in Illinois. Sangamon soils in this same line indicate that the forest-prairie border may have been west of its present boundary by as much as 310 miles, in eastern Nebraska. This indicates higher precipitation than at present during at least parts of the LIG. Comparisons of geologically based reconstructions of climate to atmospheric general circulation model (AGCM) simulations are used to forecast future climates. Both AGCM results and geologic data indicate higher temperatures in the Midcontinent and high latitudes of North America during the LIG. However, the greater precipitation in the Midconti-nent shown in the geologic record of the LIG contradicts the AGCM results, which indicates that precipitation was similar to or even less than present during this period. This suggests that AGCM's are better at simulating temperature fields than they are at simulating precipitation fields. Many stream channels in eastern Nebraska were altered in the early 1900's to help alleviate flooding. Channel straightening is recognized as a cause of channel-stability problems, such as downstream deposition and upstream degradation and widening of the channel, which are hazards to roads and bridges. In addition, channel banks, which comprise highly erodible soils, were severely eroded by the floods of 1993. Many small county bridges failed or were closed as a result of the floods. The USGS, in cooperation with the Papio-Missouri River and Lower Platte South Natural Resources Districts, the Nebraska Department of Roads, the NNRC, the Federal Highway Administration, the University of Nebraska-Lincoln (UNL), the Agricultural Research Service, and the U.S. Army Corps of Engineers, is examining the effects of channel instabilities on bridge structures and flood-plain resources in a 23-county area of eastern Nebraska. Improved methods for anticipating future channel stability and geometry and the identification of possible types of remediation measures to stabilize the channels are intended to benefit planners, structural designers, and resource managers. The flood in 1993 in the lower Missouri River Basin has reinforced the need to evaluate the effectiveness and cost of current flood mitigation and management methods to maintain flood-plain ecosystems, wetlands, and facilities along the Missouri River and its tributaries. Historic channel maps near the town of Rulo have been created to assess potential restoration sites, identify areas affected by flooding, and determine river-management alternatives. After operating for more than 100 years, a lead refinery in Omaha, Nebraska, on the banks of the Missouri River, closed. Discharges from the refinery commonly exceeded water-quality standards for lead, arsenic, zinc, and antimony. Currently, the contamination threat is from ground water that moves from beneath the facility into the Missouri River. USGS scientists are conducting toxicity tests using ground water, river water, and sediments to document if the metals present are available to fish and wildlife, and if they are, to what extent they are toxic. This research is a cooperative project with the U.S. Environmental Protection Agency to provide data for clean-up efforts at the facility. The Omaha-Kansas City corridor is a major population center where rapid urbanization and development of resources that support urbanization are in conflict with agricultural land use (fig. 4). Figure 4. 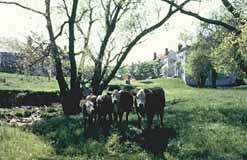 Cows and condos compete for the same land (Photo copyright by Amy Lilienfeld). This cooperative project, between the Conservation and Survey Division (CSD) at the University of Nebraska-Lincoln (UNL) and the USGS, is preparing surficial materials maps that are intended to help planners and others address urban, groundwater, and agricultural land-use issues as well as help them evaluate geologic hazards and constraints in this area. Maps of surface and subsurface materials in the Greater Omaha area (about 500 square miles) in eastern Nebraska and western Iowa and in the St. Joseph area (about 660 square miles) in northwestern Missouri and northeastern Kansas will display details of surficial deposits at scales of 1:100,000 and 1:62,500, respectively. The maps will provide data such as thickness and distribution of loess and glacial deposits, depth to bedrock, and extent of buried glacial drainageways. These and other map data are intended to aid in resolving groundwater, aggregate resource, and environmental issues in rapidly growing areas in the corridor. For example, buried glacial drainageways are excellent sources of ground water because they commonly contain coarse sand and gravel, but they may be susceptible to contamination if they are shallow. The National Aerial Photography Program (NAPP) began collecting aerial photography for the State of Nebraska in February-April 1999. This multipurpose photography will be used to update the 1993-94 DOQ image base for Nebraska. The uses for NAPP photographs include natural-resource management; disaster and hazards planning, mitigation, and response; property assessment; agriculture; education; and recreation.